Hungary is replaceable. Budapest is replaceable. While anyone who knows and loves the Hungarian capital would be saddened to see the Central European University forced to go, those of us who have had our fill of seven years of Hungary’s slide into a wildly corrupt autocracy also applaud Austrian Chancellor Christian Kern’s decision to begin high level negotiations aimed at moving CEU to Vienna. According to the APA Austrian news agency, Chancellor Kern has started negotiating with the representatives of George Soros about relocating CEU to the Austrian capital. Zsolt Enyedi, CEU’s Pro-Rector for Hungarian affairs, confirmed that shutting down Budapest operations and moving to Vienna is an option. Mr. Enyedi added that the university still aims to fight the punitive legislation approved by Parliament on Tuesday. Liberal Austrian opposition MP Beate Meinl-Reisinger commented that moving CEU to Vienna would be a “grand opportunity” for the capital city. As of Thursday afternoon, as the author of this short update awaits his flight at Toronto’s Billy Bishop Airport, there is no news from President János Áder’s office about whether he will return the bill unsigned to parliament, or send it for review to the Constitutional Court or indeed sign off on it. What we do know, is that Mr. Áder daughter attended an American international school that functions within a legal framework almost identical to that of CEU. The same can be said for Prime Minister Orbán’s daughter, Ráhel, who studied in Switzerland. 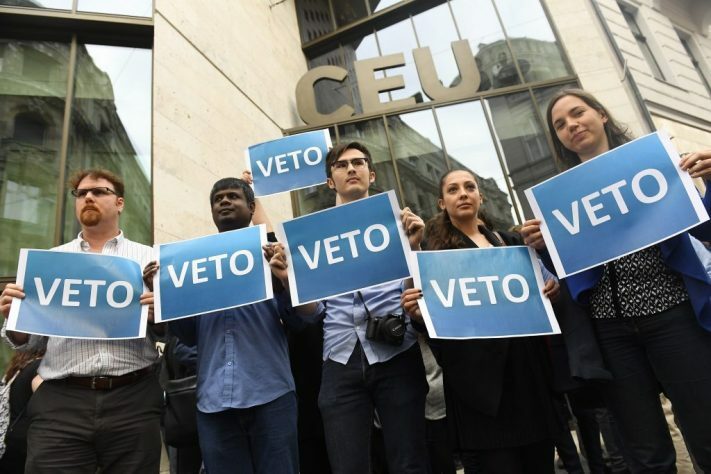 CEU students protest in Budapest, calling on President Áder to “veto” the bill. 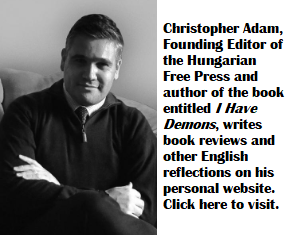 The Hungarian Christian Right’s anti-liberal anti-Jewish hatred is the key to why, a wonderful Hungarian University, founded by a liberal Hungarian Jew, George Soros, is being persecuted. This is why, George Lukács’s statue has been sent packing, this is why, the last remaining bastions of free, and liberal thinking will be shut down soon in Hungary. Hungary’s population either does not want to, or is unable to put up a fight. Mr. Soros may be excused if he moves whatever can be saved to Vienna, to sustain the spirit of liberalism in a place, where the flames of racial intolerance are less likely to burn him and those who value academic freedom, and the tolerance of diversity. May he live and be blessed to complete this migration. The Central European University should stay where it is. If George Soros wants it moved to Vienna, it most definitely is a bad idea. Propaganda and disinformation is never a legitimate reason to change anything. Huge reductions of spending on education <5% GDP. Centralizing of the education system, eliminating self government in universities, intimidating their leadership e.g. by threats of liquidation (Corvinus, ELTE Dept). Denying the choice of school books. Reducing the min edu age to 16 years old. Channeling many students into antiquated trades education. General anti-intellectual and anti-free-thinking propaganda. The CEU, one of the greatest international promotions for Hungary is undesirable for this lot, instead Orban has an ambassador for soccer and for Pisgkas affairs (sic!!). Puskas affairs (pronounced Pushkash, the famous soccer player of the 1960s). This is not a joke folks, this guy was issued a diplomatic passport, etc. Soros does not want to move it. But Orbán clearly wants to shut it down.